There's a lot of cooking to be done during Thanksgiving. 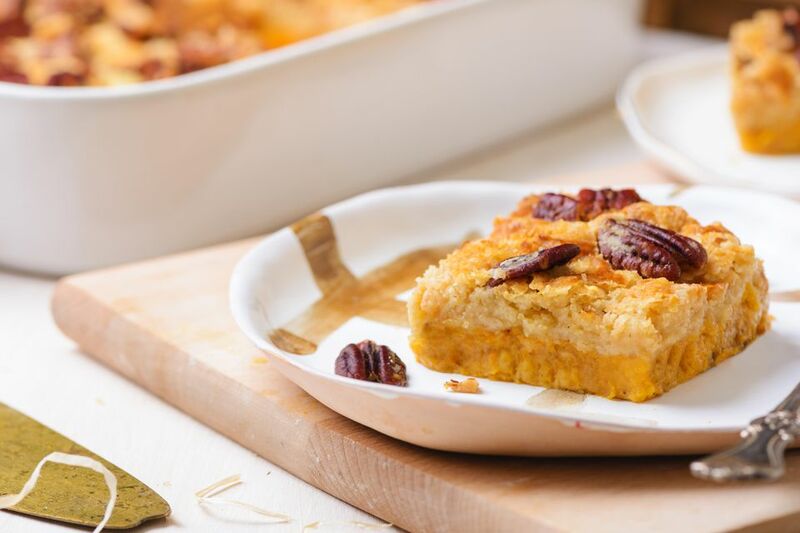 If you want a simpler dessert, this recipe for Pumpkin Dump Cake is perfect for busy schedules. Just like the title says, all you have to do is gather your ingredients and "dump" them into a cake pan. Although this dessert is cut into squares, it’s really more of a “scooping” dessert, so you can squeeze out more servings than a traditional cake. Preheat the oven to 350 F and lightly grease a 9x13-inch pan. In a large bowl, add the eggs, pumpkin, evaporated milk, nutmeg, spices, salt, and granulated sugar and whisk to combine. Pour the filling into the prepared pan. Sprinkle the filling with the cake mix. Gently pat down the cake mix with a spoon. Don’t push so hard that the filling comes up through the dry cake mix. Sprinkle the top with the nuts. Completely drizzle the top with butter. Cool and cut the cake into squares for serving. You may substitute 4 teaspoons of Pumpkin Pie Spice, Apple Pie Spice or Mixed Spice instead of the individual spices.